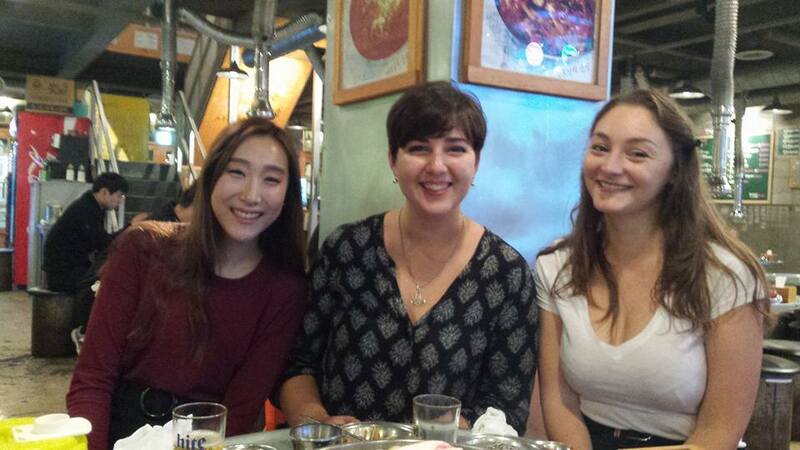 I’ve recently been missing some things about Korea – particularly food. So, I thought I’d write a post about some of my favorite dishes I had while I was living in Ulsan! – While it’s not technically a Korean dish (it’s Japanese), there were shabu shabu restaurants everywhere in Korea! Steve and I probably ate this more than anything else when we went out for dinner. Shabu shabu consists of thinly sliced pieces of raw meat, which you cook in a boiling pot of broth at your table. You also add vegetables like bok choy and cabbage. When everything is cooked, you can roll it up in rice paper along with an assortment of other raw veggies! – I loved eating barbecue in Korea, especially samgyeopsal (삼겹살) which is pork belly. It was always so much fun going out to a restaurant with friends and cooking your dinner right at the table. My favorite restaurant in downtown Ulsan always put out a side dish of spicy bean sprouts and I also enjoyed ssamjang (쌈장), which is a thick sauce you can dip your meat in before you wrap it in a lettuce leaf. – Gamjatang is a pork spine stew that has potatoes, radish greens, onions, peppers, and sometimes noodles or dumplings. It was one of my favorite things to eat during the super cold winter months because it certainly warmed you right up! – Pajeon is a green onion pancake that I wish I had gotten to eat more of during my stay. My favorite kind had seafood cooked into it (squid and prawn). Usually not enough for a whole meal, but definitely good for a yummy snack. – Dak galbi is a stir fried chicken dish made with gochujang (red pepper paste), cabbage, onions, and rice cakes. You can usually add in other items, like cheese or ramen (that’s how I liked it!). Everything is cooked together on a big hot plate. When it’s ready, just scoop and eat! In addition to these particular dishes, I also miss chains like Paris Baguette, Lotteria, and Ediya. Paris Baguette had cheap, yummy sandwiches and salads which were great in a pinch. At Lotteria, I loved the Mozzerella in the Burger sandwich. And finally, at Ediya, they had a toffee nut latte which was absolutely to die for! Wow, I’ve been really lazy about posting recently! Time to get caught up. March 1st was Independence Movement Day, which is a national holiday, so everyone had off from work. 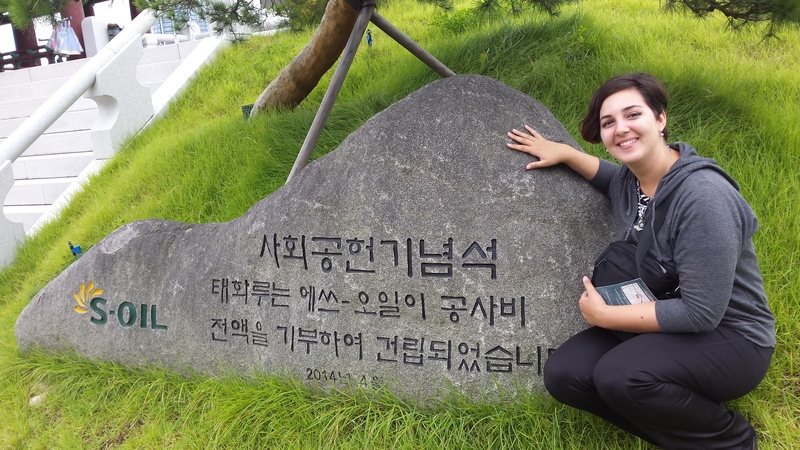 Hannah and I decided to meet up in Daegu. I decided to cut down my travel time and take the KTX. We were supposed to meet up at noon, but I got there much earlier than expected (like always because I’m obviously crazy about ever being late). I took the subway straight to Banwoldang Stating to wait for Hannah. There is a lot of underground shopping there, so I decided to treat myself to some new cosmetics. When Hannah arrived, we did some more shopping before deciding we were starving and went off to find some lunch. Hannah had heard about an all-you-can-eat barbecue place for 10,000 won per person. That sounded amazing, so we took the subway to find it. After walking around for a while, we found the restaurant, only to discover that it was closed! So disappointing. And this always seems to happen to us. Last time we were in Daegu together, it was the Hello Kitty Cafe that was shut down. A little upset, we went back to downtown Daegu to try and find something else. Then, we saw it. 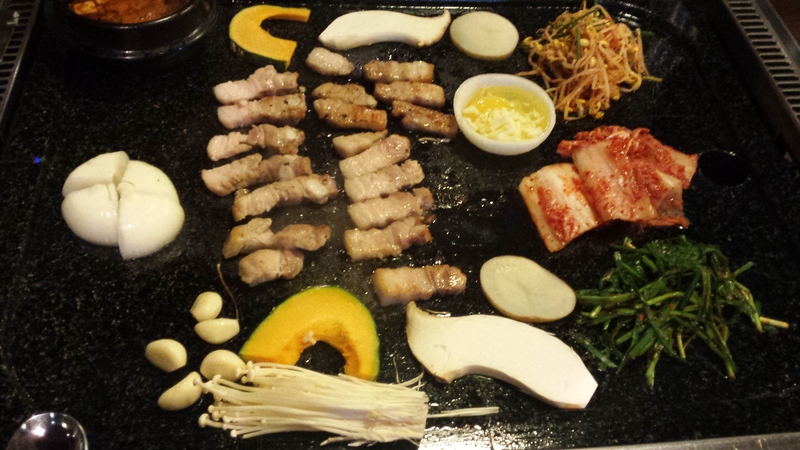 Another all-you-can-eat barbecue restaurant for 9,900 won per person! It was called Mr. Pig and we rushed in. There was a line practically out the door. When we were finally seated, we were ready to go help ourselves. Oh. My. God. It was beautiful! There was unlimited rice and noodles, Chinese-style chicken, fried mandu, french fries, soup, and tteokbokki. Then, the good stuff. 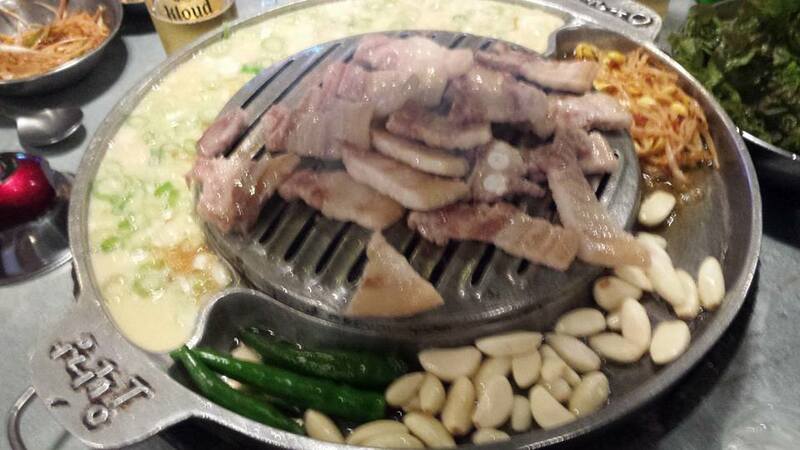 There was an assortment of both pork and beef to pile onto plates and cook yourself. Also, lots of veggies to wrap your meat in. We had some serious eyes bigger than stomach syndrome going on. I’m not sure how much we ate, but it was a lot. And it was worth every bite. After we paid, we walked around some more and hit up ArtBox (one of our favorite stores). When we had finally digested our amazing lunch, we had to have dessert, of course! We found a cute dessert cafe and each got a caramel macchiato and an order of cinnamon caramel honey bread to share. Delicious. We spent a lot of time just hanging out and talking. After a slight snafu over train times (Hannah had missed the last one back to Sangju), her boyfriend said he would come pick her up and she came with me to the KTX station. Overall, it was a great day in Daegu! This past Friday, November 6, was my 25th birthday. It was the first time I’ve ever been away from my friends and family and couldn’t celebrate with them. It was really hard because I LOVE birthdays and I always try to do something really fun. Last year, I did an Italian themed murder mystery dinner. This year was really great, though! Around lunch time on Friday, Steve came over and we went to Flapjack Pantry. I got a cheeseburger with bacon and a hashbrown (yum!) and Steve got a Cajun chicken salad. The weather was beautiful, so we walked around and got a coffee after. Then, I worked all day. None of my coworkers knew it was my birthday, and I really didn’t care to tell them. It was a good day, though. My students were great and I had lots of breaks. 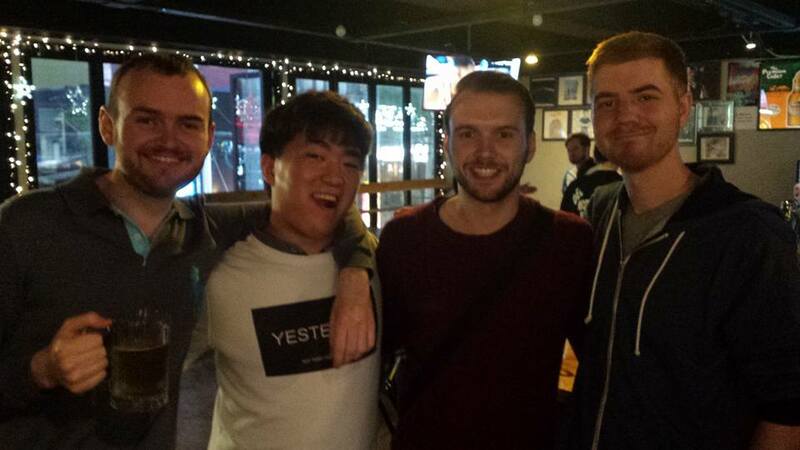 After work, Steve and I met up with Nick, Hailey, my Korean friend Lily, and Lily’s boyfriend. I really wanted pizza, so we went downtown to find a Western restaurant… but everything was closed! Lily’s boyfriend even tried calling some restaurants to see if they would be open. No such luck. We ended up doing pork barbecue instead, which was delicious. It was super tender and it came with roast garlic and some tasty egg thing. After dinner, we went to Sticky Fingers, one of the foreigner bars. Some other friends met us there for drinks. Steve had also gotten me a cheesecake. It wasn’t exactly New York style, but it was good. I was also really happy he remembered that cheesecake is my favorite! Steve, Hong, Mike, and Peter. Following drinks at Sticky’s, Steve, Nick, Hailey, Dado, Sonya, Ben, Hong, and I made our way to norebang (karaoke). We got a HUGE room and ordered more food and drinks. There was a fruit platter, and noodles, and fried eggs, and french fries. I had no idea where it was all coming from. We spent hours belting everything from Sinatra, to Journey, The Little Mermaid, Backstreet Boys, Rammstein, and everything in between. I definitely did more screaming than singing, but I had a freakin’ blast. It was after 5 AM when we finally called it a night. On the way out, everyone got free ice cream, and Nick saw one of our coworkers. Who was drunk out of his mind. Such a good birthday. Thanks to everyone who came out and made it special! Yesterday was a pretty good day. My classes went well. Even my really, really bad class wasn’t so bad. Why, you ask? Because I bribed them. With stickers. And I have absolutely no shame about it. After work, Steve and I had plans to go for barbecue in my neighborhood. I was sitting on my bed watching Youtube videos when he knocked. I answered, and he told me I had to come see “this.” I wondered what “this” could be. Turns out, “this” was my next door neighbor passed the hell out in the stairwell. Her purse was on the floor next to her, contents spilling everywhere. I was in shock to see someone so drunk. I grabbed my jacket and bag. As we were walking down the stairs to head out, I felt so bad and I couldn’t just leave her there. She was barely verbal, slurring things in Korean, but I got her sitting up. After a while, I helped her to stand. She almost tumbled down the stairs. It was a struggle, but I finally got her up the stairs and to her door. However, she couldn’t find her key. She kept ringing the door bell and knocking, to no avail. I’m pretty sure she lives by herself, but we tried. Oh, it was so upsetting! I sat with her a few more minutes, but she waved us off. Even the other foreigner who lives on my floor came out to see what was going on. Anyway, Steve and I made our way to the restaurant-filled street near my place. We decided on a pork barbecue place and got pork belly and cold noodles. It was so delicious. After dinner, we walked downtown, but it was pretty dead. We got a beer and munched on some pretzels at Sticky Fingers, one of the expat bars. Then, we stopped in Angel-in-us (a coffee shop chain), and I got a coffee snow (like a frappuccino, but better). Steve wanted ice cream, so we stopped at an ice cream shop as well. He got a flavor called apple mint. I tried it. It tasted like toothpaste. Like, gross toothpaste. After I mentioned it, he agreed but ate it anyway. That was my exciting evening! Bamboo Forests, Buses, and Barbecue. Oh My! Today, I met up with my Korean friend, Jihoon, because he wanted to give me a Korean grammar book so I can practice my language skills. I thought that was so nice of him! We met at the bus stop nearest my apartment and decided to go for bubble tea at a place I discovered a few days ago. He told me he’s only had it once before. I got honey melon and he got taro. It was delicious and we hung out in the cafe and talked. 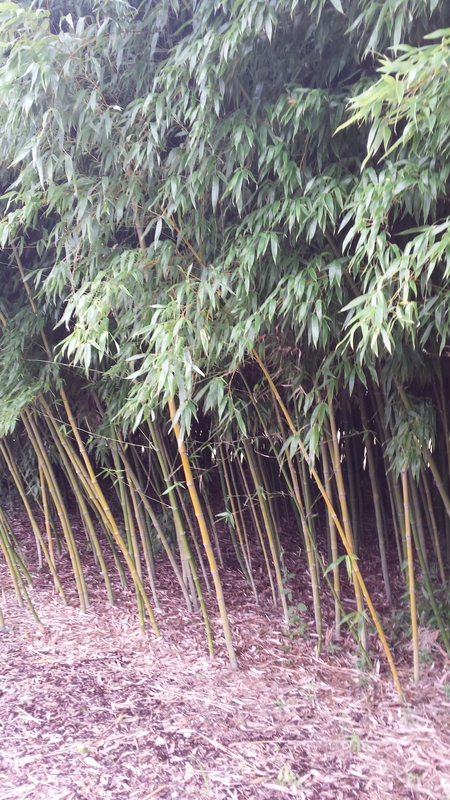 After a while, he asked me if I had been to the bamboo forest yet. I hadn’t, but I was curious. He said he would take me there. So, we gathered our things and walked to the bus. I think I’ve mentioned before, but riding the bus here is insane. The driver will start driving before the doors are even closed. You will trip and stumble like a drunk person all the way to your seat. If you can find one, that is. If not, good luck clutching onto the handles, or a seat, and trying to avoid crashing into the ajumma beside you. It’s almost like a game. A game that isn’t fun, but still requires lots of skill. Finally, we made it to our stop near the Taehwa River. 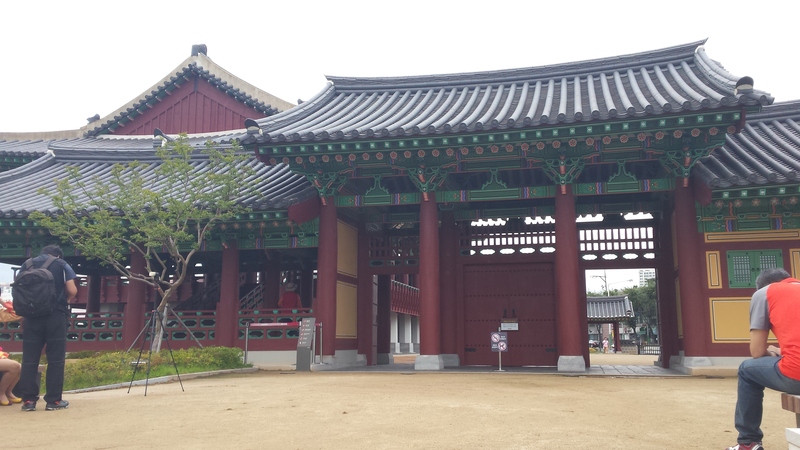 Jihoon and I walked over and there was a beautiful structure I was eager to learn more about. He explained it to me as a temple where his ancestors would drink a lot. 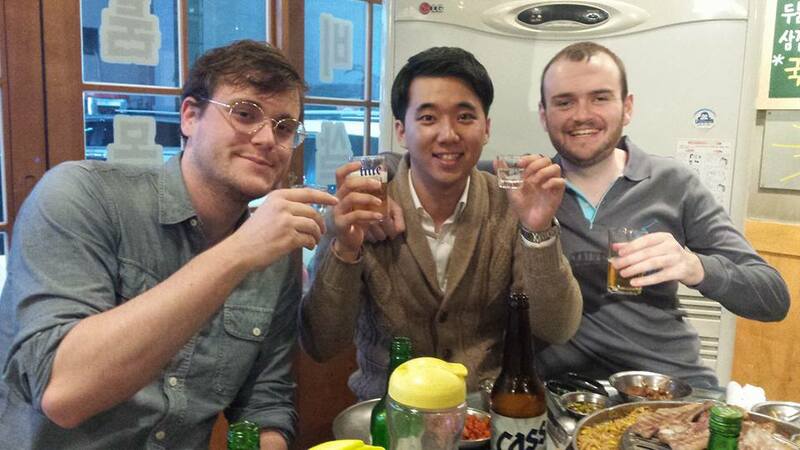 They really like alcohol in Korea. We stopped in a tiny museum at the foot of the temple, which had lots of beautiful maps and artifacts. Then, we climbed up the stairs and went inside (after taking our shoes off, of course). 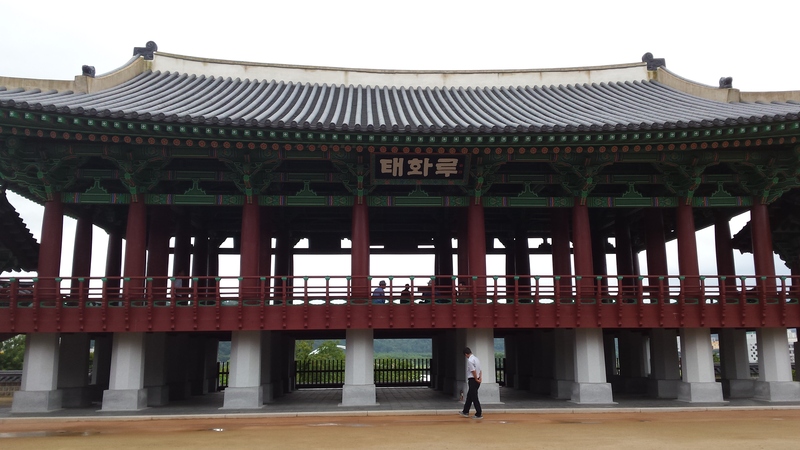 It was so incredible, as was the view of the Taehwa River. 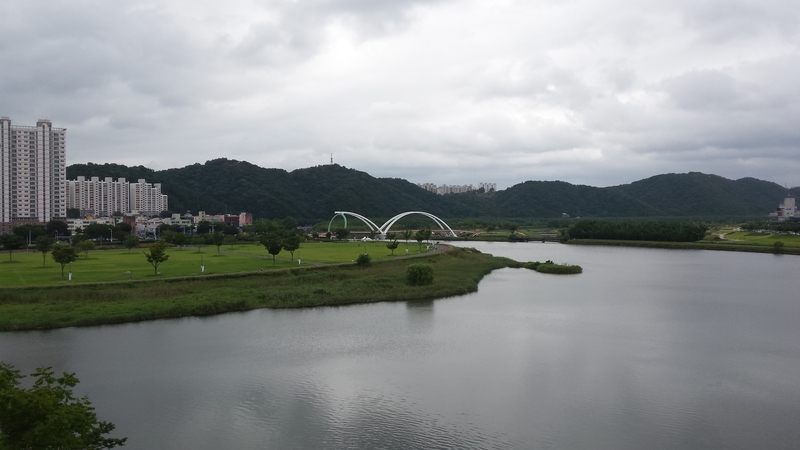 View of the Taehwa River. We put our shoes on and walked down the path to the bamboo forest. There were lots of people out and soothing music played from a series of speakers that lined the path. It was very cool. You could see mountains and trees and so much beautiful greenery. There was also a bridge that Jihoon and I decided to climb up and walk across. He almost got hit by a cyclist. That’s when we turned around and just went to the forest. Near the entrance, there were exercise machines set up for anyone who wanted to use them. Pretty cool. We began our walk. 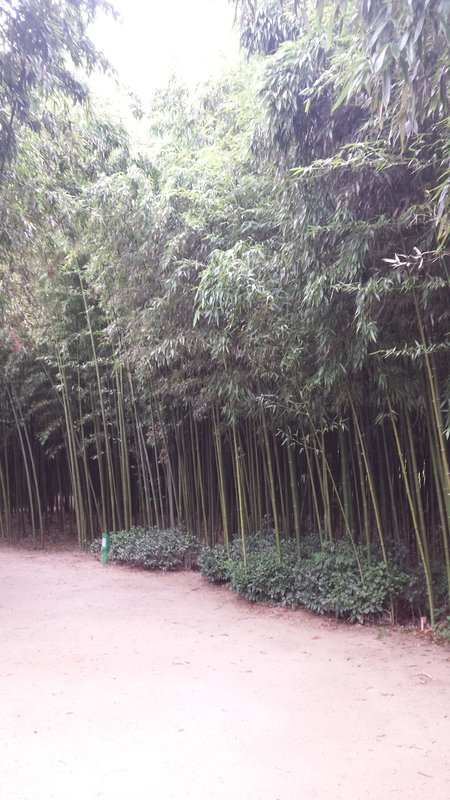 The bamboo was so amazing, unlike anything I’ve ever seen. It was a deep jade and towered above us. Near the top, the leaves fluttered around in the breeze. It was almost like I had been transported to some fantasy land. I was simply in awe, touching it and taking pictures. 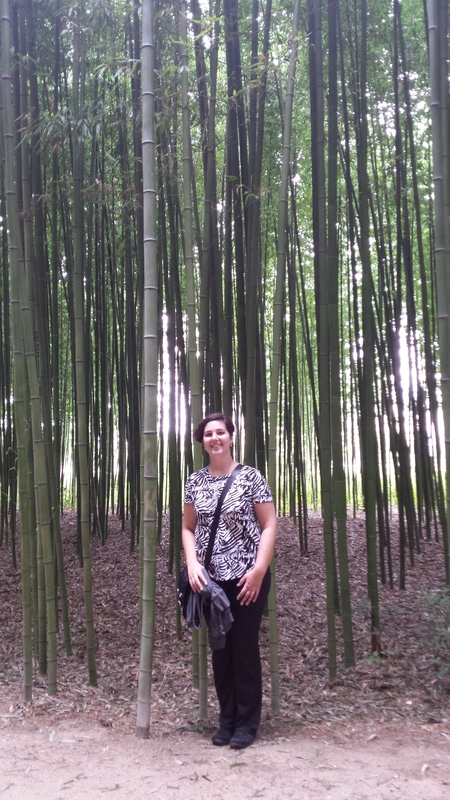 Me by the bamboo. Like a tourist. 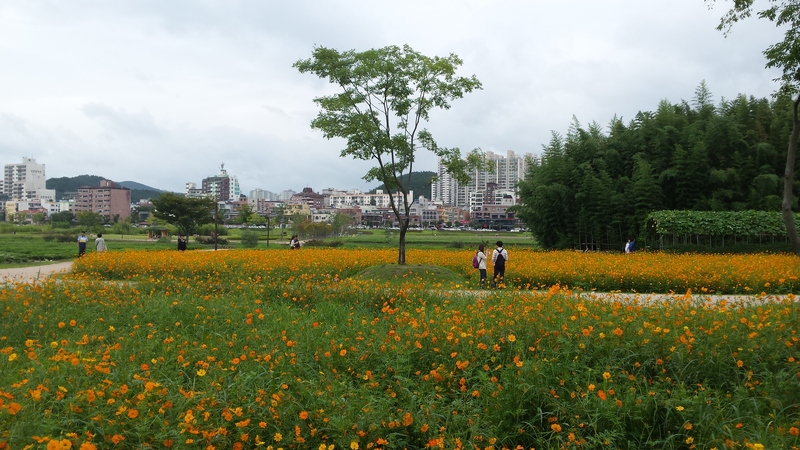 After finding our way out, we walked around several fields of flowers before making our way back to the bus stop. Jihoon rode with me until we got to my stop, before heading home himself. 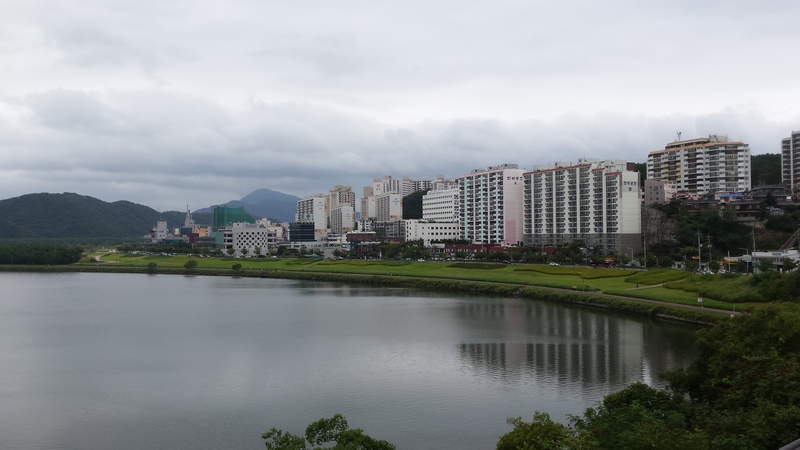 I rested at home for a bit before walking to meet my friend Lily in Samsan. We have been talking online for several months, but this would be our first time meeting in person. She told me to meet her at the Lotte Department Store Plaza. After a while, we found each other (I couldn’t get WiFi and missed several of her messages). She wanted to take me for barbecue and I followed her through the tight, crowded streets of Samsan. We finally found our restaurant, one which specialized in pork belly. Yum! There was kimchi and spicy bean sprouts and spicy green onions. On the grill, we also had mushrooms, pumpkin, onions. The waiter brought the pork out and began to cook it for us. After a while, we even got to see what Lily called “the fire show.” It was awesome. She showed me how to take a lettuce leaf, place a perilla leaf in it, then some pickled onion, and the meat. We rolled it all up and ate it in one bite. Delicious! After we finished the pork, Lily ordered us some fried rice. 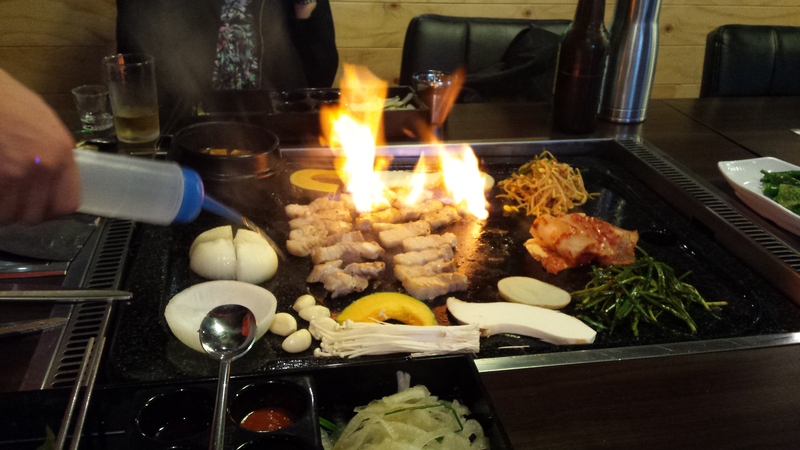 They cooked it on the grill in front of us and there was kimchi, greens, egg, and cheese inside. Following dinner, we decided to go for a drink at Thursday Party. We talked about music, movies, and work. Lily taught me to say some new words in Korean and told me that my pronunciation was good. I hope she wasn’t just saying that! I also tried to read hangeul on several signs around the bar, and she was very impressed. I’m trying!